Week 7 – From Idea to Reality – Try it!! What an amazing gift we have been given…the ability to turn a chosen thought (idealization) into a more detailed vision (visualization) and ultimately manifest it into reality (materialization or manifestation). This week in the Master Key Mastermind we focused on this very process. Try it. Think of an idea. Then flush it out (or color it in, or whatever metaphor you’d prefer) into a very detailed vision in your minds eye. Then hold that vision as often as feasibly possible all day every day until it materializes. The complexity of the the original idea will contribute to the timeline of manifestation but what a wonderful gift. We also learned that by conscientiously following this process it will bolster your faith, confidence and your ability to concentrate which is vitally important since excluding extraneous thoughts is essential to optimal success. Faith, confidence and the ability to concentrate are valuable in all aspects of your life and totally worth developing…another great reason to try it. Think of an idea. Flush it out into a very detailed vision in your minds eye and then hold that vision long and often every day. Further it is important to note that clarity and accuracy in the process matters…significantly! You must build it firmly and securely in your mental world before it can take form in your outer world. Go ahead and try it…do it now! 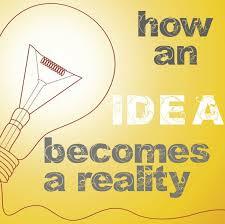 Think of an idea. Imagine the details of every aspect of that idea and then hold that detailed vision in your minds eye every waking moment you can. Imagine what it feels like in your reality and begin enjoying that feeling even before it actually shows up in tangible form. How cool is that–to experience the joy, satisfaction, or whatever feeling your idea manifested will bring, now and then. From idea to reality. Is that really how things happen? Great question. To find out…try it! Do it now!! Great thoughts! Thank you for sharing.